Comic-Con kicked off today, briefly transforming San Diego into the crowded nexus of the pop culture world. That doesn’t mean that the gears of casting info and development deals have stopped, though, so let’s kick off with our latest descent into Hell. 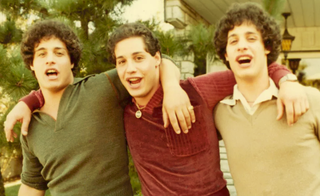 First up: Variety reports that Sundance documentary hit Three Identical Strangers is being transformed into a narrative drama film, with original producers Raw partnering with Film4 to make the transition. Telling the “mind-boggling” story of three triplets who suddenly reunited at the age of 19 after being separated at birth—and only getting stranger from there—Tim Wardle’s film set off a bidding war for the movie rights to its subject’s lives when it debuted last month. Joaquin Phoenix’s Joker movie is definitely happening, no matter what Jared Leto might say (or petulantly tattoo) about it. Per THR, Warner Bros. has now set an October 4, 2019 release date for the film, which will be directed by The Hangover’s Todd Phillips. The Phoenix Joker movie is being described as “experimental” and “darker” in tone, because “extra grit” was definitely what D.C.’s film output was lacking. Actress Alicia Witt is getting into the Jane Austen game, with Deadline reporting that the Urban Legend star will lead a modern adaptation of Austen’s Persuasion, named, hilariously, Modern Persuasion. Alex Appel and Jonathan Lisecki are set to direct. Finally, we’ve got news on where you’ll be able to catch Sky’s upcoming contemporary fantasy adaptation, A Discovery Of Witches, Stateside. The series—about a brilliant historian who is also a witch who is also in love with a vampire—will stream over here on both Sundance Now and Shudder.